Citation: C N Trueman "Roman Roads"
The Romans were famous for their roads. Some Roman roads exist to this day, nearly 2000 years after they were made. Roman roads were superbly made. Why did the Romans put so much effort into building roads? Rome made a great deal of money from trade in Europe. Some of this trade involved transport by sea. More frequently, the Romans used roads. Also with so much of Western Europe conquered by the Romans, the Romans needed roads to move their troops around quickly. Poorly built roads would not help this. When the Romans arrived in England, they found no roads to use. Instead they had to make do with tracks used by the Britons. It was not unusual for these tracks to be in very poor condition as they were usually on high ground and open to all types of weather. A good road system also made it easier for the emperors to control their empire as messages and orders could be sent quickly. 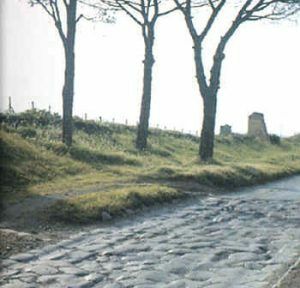 Roman roads were famed for being straight and well made. However, the Romans usually built roads around a natural obstacle rather than go through it. The Romans did not have a compass or maps to help them build roads. How did they manage it? Surveyors used a tool called a groma. This was an instrument that had two pieces of wood nailed together so that they formed a square cross with right-angles in all the corners. Each piece of wood had lead weights attached to the ends. When one lead weight from the same piece of wood lined up with the one in front of it, the surveyor knew that he had a straight line. Once the surveyor was convinced that he had mapped out a straight line, wooden posts were dug into the ground to mark out the straight line. The road was built along this line. Ditches were dug either side of the road to allow for drainage. Roman roads tended to be built higher than the level of earth around them – this, again, helped drainage. The bulk of the actual building was done by Roman soldiers. By doing this, the Romans could rely on the gained expertise of the soldiers. The authorities could also rely on the fact that the soldiers would do the best they could for Rome – by building excellent roads. Roman roads were well used throughout the empire. However, many of those who used them had to walk – including merchants – as chariots and horses were expensive. A wealthy merchant could afford a wagon pulled by horses. The roads were built so that two of these wagons could pass on both sides of the roads. When the Romans left Britain, the Britons did not use their roads. Not only were the roads not used, but villas, baths and other buildings were shunned by the Britons because of their association with the Romans. Also the Britons did not know how to keep the roads in good repair as they had not been used by them when the roads were built. Regardless of this, Roman roads were so well made that they lasted for centuries. The main roads went from London to York (via Lincoln), London to Wroxeter, London to Dover and Exeter to York via Bath, Cirencester and Lincoln.